At A to Z Eye Care, part of providing the best possible eye care to our patients is helping those patients decide if LASIK surgery is right for them. There are many factors that will help determine this, the current state of your eyes being one of the most important. However, it’s also important to consider how you as a patient feel about the potential risks, side effects, and everything else in between. That’s why your local optometrists at A to Z Eye Care are always available to help provide you with any information you may be seeking in regards to LASIK surgery. LASIK, also referred to simply as laser eye surgery, is a breakthrough in vision correction therapy. This outpatient surgery performed by trained ophthalmologists using a laser to correct refraction errors in the eye, and provides a permanent, alternative solution to eye glasses or contact lenses. What Should I Consider Before Electing for LASIK Surgery? Be familiar with your surgeon so that you feel as relaxed as possible going into surgery. Your LASIK specialists will help you find an experienced, board-certified surgeon that is right for you. It’s also important to know that your surgeon will continue caring for you after surgery is complete. Those who are more nearsighted are more prone to needing refinements — or repeat procedures. Talk to a knowledgeable LASIK specialist in order to gain a better understanding of your refractive error and learn whether refinements may end up being necessary for you. No eye surgery is a minor affair, so it’s important to understand what the risks are — even if minimal. They may only affect 2-5% of LASIK patients, but you’ll want to fully understand whether you feel the risk of overcorrection, undercorrection, or cornea damage is worth it for you. Your optometrist will guide you through the steps so you can be confident in the whole process. It’s important to be fully aware of the post-surgical care required in order to make sure you are adequately prepared to be released post-surgery. Medications can also be given to help with healing, which can affect your eyesight. It’s also important to be aware of any other limitations for a period after surgery, including playing sports or even wearing makeup. 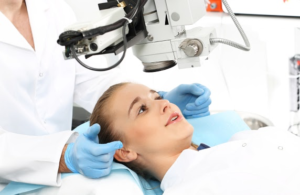 If you think you may be a good candidate for LASIK surgery and are interested in learning more, the eye care professionals at A to Z Eye Care are ready to step in and help you. A to Z Eye Care serves Arcata, Eureka, and surrounding cities in and near Humboldt County. Our mission is to help each of our patients achieve healthy eyes and clear vision. Our friendly doctors and staff would be more than happy to help answer any questions you may have. What are you waiting for? Contact us today at (707) 822-7641 to schedule your appointment today.